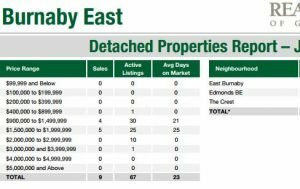 Burnaby Market Update, a central place you can find real estate statistic and market update information for Burnaby East, Burnaby South and Burnaby North. The information will include Detached House, Townhouse and Condo with different perspective such as Average Price per sqft, various areas, etc. Contact us if you need more information. I am more than happy to assist you.